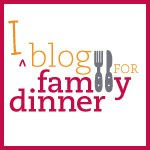 Here are some interesting food blogs I found this week. Leftover Queen Lots of great stuff here on food, food blogs, and eating well. Dinners for a Year and Beyond Meeting the challenge of family dinner with some very impressive entrees and recipes. Food on the Food Start with the "Intro to her Cookbook," posted in Feb 2007, which explains her project, a recipe from her American Immigrant cookbook every Friday. She's still regularly posting on a wide variety of family, food, and foolishness. Ed Levine's Serious Eats The infamous Ed Levine searching out good eats throughout New York City. Feeding the Kids Tips on feeding kids healthy food; promotes recently published book. Leap Year Cocktail Since it's a Leap Year Day (2.29.08), and a Friday to boot, here's a wacky cocktail to try. Happy Friday! Thanks for the link. I like the topic of your blog. We try to eat dinner as often as possible or at least as many of us as possible. Keep up the great work. Are your family meals legendary? Have your family recipes been passed down from generation to generation? Do you think you have the best home cooked food out there?